Adam Smith recently joined the online poker phenomenon here in the UK. In a new feature he talks us through his discoveries and the baby steps he is making on his poker journey. Adam is 24 years old and a sales manager by profession. He has high ambitions to one day play alongside the greats in Vegas. Right now, he is busy building up his online bank roll as he begins the steps on his poker journey. Follow his progression in this weekly column designed to enlighten new players to the game. Poker is simply the greatest game ever invented, and how long has this taken me to realise this? In the UK, drugs, alcohol and nicotine were always thought of as the most addictive, and damaging product, to our young healthy lives. How wrong the bigwigs were who claimed this. 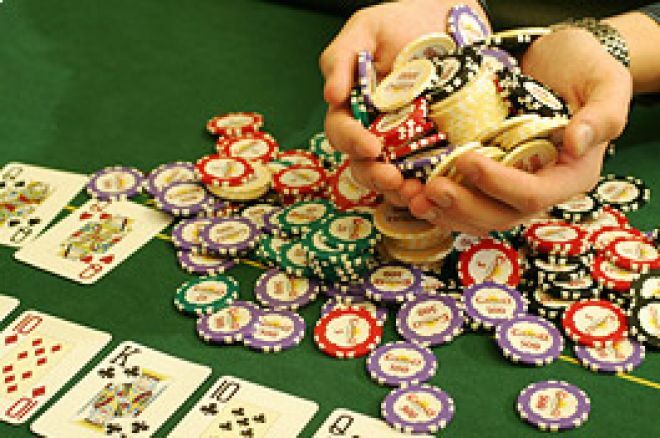 Without doubt the most addictive product in the UK currently is poker. You cannot turn on the TV at the moment without seeing live feeds from Las Vegas, tournaments from the UK and slightly delayed Internet ring games. It is without doubt a 24/7 game. So how did I get involved? An innocent email from a friend started the trend I find myself in now, and in all honesty, I will always be in his debt for pointing me towards the game. I have always played cards - Crib,Brag etc, but apart from the odd game of 7 card stud during a lads night down the local, poker was definitely an area that I had no idea about. He introduced me to a well known site, mailed me the basics and I was off. I started off playing for fun money, but soon realised that although this is a good tool to learn the basics - Hand rankings, betting, position etc, that to learn how to correctly play poker real money HAS to be involved. I made my best decision for a while when I next logged on and deposited £20. Now although this doesn't seem a lot to most people out there, £20 is a lot when you have no real idea of cash play. To win double that amount would be the achievement of the year for me. Well to cut things short this £20 lasted all of 2 hours. When playing 10/20p NL Hold em I soon found that I was calling bets with nothing as I was still in play money mode and began losing my bankroll. I Think I ended up losing the remaining £14 or so with a bad beat - Ad Ac against 9s 9h, or something similar. Did I really want to deposit again and probably lose another £20? Of course I did. There is something in the British mans persona that won't admit defeat. If we are having fun and even if it costs us money, we don't mind. Due to poker I was constantly waking up and then being unable to get back to sleep until I had replayed the last big hand in my head. As a young guy that works hard this obviously isn't ideal when you have a 12 hour day coming up. I found myself dreaming about winning various titles, and accolades and then unfortunately would wake up! So how have I progressed in 4 months. I am still addicted to Internet poker with my average being 5/6 hours played per day, with a few hours extra hours reading up various sites and books. I had built my bank to just over £600 which I was proud of and was playing good solid poker. I had cashed in 15 out of 23 MTTs and was playing some inspired stuff. When, disaster struck, I lost my entire bank roll in 2 days. I think this was more my bad play than anything else as I had other distractions at the time (now a dad to be). Of course I deposited again and am slowly building my bank back up but have realised, more than anything, that concentration is the most important ingredient in making a good ''poker profit pie''. Next week Adam talks about bad beats, making his first tournament cash and the lessons he has learned so far. Ed note: New poker players are made very welcome at VC Poker with a $100 bonus. No days off for Bet365!